Traditional smallholder farming does no longer provide for decent livelihoods in most parts of the world. Its low productivity practices and occasional local marketing of surplus production is just not profitable enough. Prices are falling for staple crops and, increasingly, also for commodity crops such as coffee and cotton ; they are only viable if grown on larger areas. For small farmers it is better to specialise in products with a high return from a small area, and thus get the maximum out of whatever land they have. Their only chance to make a decent living out of a few acres is to play in the league of highvalue crops. Horticulture crops play a major role in alleviating poverty. Despite their relatively small share in arable land use, the value that horticultural production adds to total agriculture is impressive. In many countries, the value of horticultural production equals or even surpasses the value of cereal production. Staple crop production is important for the food security of smallholders. Growing their own food reduces the need for cash, and it is an often overlooked fact that poor people spend more than half of their income on staple food. However, nowadays they increasingly need cash as well as food, and highvalue horticulture crops are an efficient way to generate cash, even on a small plot of land. Thus the challenge for poor smallholders lies in increasing the productivity of their staple crops, and at the same time producing crops to meet their needs for cash. Many of the poorest smallholder farmers live under difficult conditions, in arid and semi-arid areas, in mountains, or far away from markets and services. Under such conditions it is obviously very difficult for small farmers to produce high-value crops in the quality demanded and at the times when they can be sold for the best prices. access to profitable marketing opportunities. The graph below shows the differences in income per acre of land that simply the availability of water for irrigation can make. The good news about this approach is that it works : the case of Tippehalli on the next page is just one of the examples that demonstrate it. The bad news is that it works only if the three pillars are in place at the same time. If just one element is missing it is very difficult for small farmers to get out of poverty. Many smallholders in India grow rain-fed crops only. With rain-fed crops they can earn 9,000 to 20,000 Rs per year from 1 acre of land – between half a dollar and one dollar a day. With irrigated high-value crops, they can earn 50,000 to 100,000 Rs from the same land – between 3 and 6 dollars a day, which means a move across the poverty line from misery to relative well-being. Water control is a key entry point to more productive and profitable farming in many places, not just in semi-arid areas. Water scarcity is one reason for introducing better water control technologies such as drip irrigation, but it is not the only one. Even in regions with abundant water, rainfall is often unpredictable and high-value crops need a regular, reliable water supply. Rain-fed farming is at the mercy of the weather which makes market-oriented farming very difficult. Water control, therefore, is more than just irrigation : it is the application of water precisely as the plants need it throughout the growing period. Water control is a precondition for small farmers who want to play in the league of high-value crops. With water control smallholders are able not only to produce bigger and better harvests, but also to schedule their production when demand and prices are highest. Affordable water control technologies have the potential to allow a large number of small farm households to escape poverty. Low-cost drip irrigation , treadle, rope and similar pumps , small-scale water storage , low-cost well drilling technologies, as well as watershed management and micro-dams are technologies that can enable farmers to produce high-value cash crops for local and more distant markets. They also enable food production during the dry season, thus increasing household incomes and improving livelihood security. Many development organisations and programmes working in rural areas distribute useful technologies to poor families free of cost, through credit or subsidies, and train them in its use. Such strategies, however well-intentioned, are unsustainable and do not reach enough people. No NGO or government institution will be able to deliver subsidised or free goods forever to all poor farmers, or ensure the availability of spare parts and the ‘ embedded services ‘ which are usually part of a package of technologies. Only technologies that are commonly available in local markets have a real chance of being widely and sustainably accessible to smallholders. This requires that an economically viable, profitable supply chain in the private sector is in place, covering all the steps from raw materials, manufacturing and assembly to distributors and spare part dealers who sell the equipment to the users. For low-cost technologies and products for poor people such supply chains normally do not develop by themselves, but their establishment can be fostered through a market creation approach. A market creation approach 5 in parallel facilitates the development of demand for a technology and the building up of a viable supply chain. To be viable, every link in the chain must be profitable and there should be an adequate number of suppliers. Market creation needs efforts over several years and substantial marketing expertise. Fostering the establishment of a profitable supply chain can be likened to walking a tightrope. In order to make a profit, a manufacturer or dealer of water control equipment needs to have a certain volume of sales, but this volume may be difficult to attain: small farmers are conservative and will only invest in a new technology if they have seen it operating successfully for some time. Water control alone is usually not sufficient for substantial livelihood improvement. Traditional smallholder farming is characterised by mainly staple crop production for household consumption ; surplus products and small quantities of cash crops are marketed occasionally. These practices no longer provide adequate income for poor households and frequently also harm the environment. The profitable production of staple crops, and, with lower world market prices, increasingly of commodities such as coffee too , requires more land. Small farmers do better if they can specialise in crops that have a high return per area. Of course, this does not mean that small farmers stop producing staple crops for their household food security. High-value crops are obviously more risky than low-value staple crops. Smallholders often prefer to produce their own food crops even if this is not the most viable option in terms of comparative advantages, but it is the best option in terms of food security and minimising risk. Thus, when fostering entry of smallholders into commercial production, it is important that food security and risk are taken into account and that support strategies are designed accordingly. This means encouraging production of intensive high-value crops on part of the land to generate some cash income, while at the same time supporting increased productivity of staple crops. The markets for agricultural products are changing very fast. Smallholders can only get a competitive advantage if they produce what is demanded in the market ( in terms of quantity, quality, packaging and timing ) in a tailormade way. An IFPRI conference on ‘ The Future of Small Farms ‘ 7 highlighted the importance of small farms for poverty reduction but also warns of the potentially dramatic consequences of a ‘ business as usual ‘ approach. In the production of high-value crops, although smallholders face a range of obstacles and constraints, such as high transaction costs in marketing and lack of information, they have a unique advantage in their ability to ‘ care for ‘ their crops. For example, silk worms are best reared by families with caring women who feed the worms every two to three hours, just as they look after children. Many horticulture crops have similar characteristics. Therefore, to enable small farmers to earn more value from their land and labour, access to affordable water control technologies needs to be combined with opportunities for higher value production and more profitable marketing. This requires the identification of promising high-value opportunities through an in-depth analysis of value chains with potential for poor smallholders, as well as the exploration of the best points of interventions to enable the exploitention of this potential. To be a valuable option for poor smallholders, the crop must be compatible with the smallholders ‘ livelihood system. Such new opportunities may be of diverse types and include new crops, new products, new varieties ; access to price and market information ; selling to more distant markets ; joint actions to reduce transaction cost ; local processing or links to processors ; off-season production ; storage when prices are low and selling when prices are good ; better links to markets and market actors ( output markets as well as access to inputs and credit ); branded and maybe certified products ( organic or fair trade ), and links to supermarkets. Because of their peculiar circumstances ( small and often scattered landholdings, high transaction costs, low purchasing power and low production volumes ), smallholder farmers usually need external support to be able to play in the high-value league. This support has to be carefully designed without market distortions and artificial subsidies. Market-based approaches are the only sustainable way of enabling smallholders to play in the high-value league persistently on their own, without external financing and technical assistance. This is by no means an easy task : it is neither particularly profitable to deal with smallholders as suppliers of agricultural products, nor to market low-cost agricultural equipment and inputs to smallholders. The transaction costs of marketing the outputs of smallholders are high, the supply is erratic and of mixed quality, and thus not very interesting for formal enterprises. This means that markets in which smallholders can play a substantial role do not come into existence on their own. Market forces alone neither lead to smallholders improving their production systems nor allow them to benefit from new market opportunities. 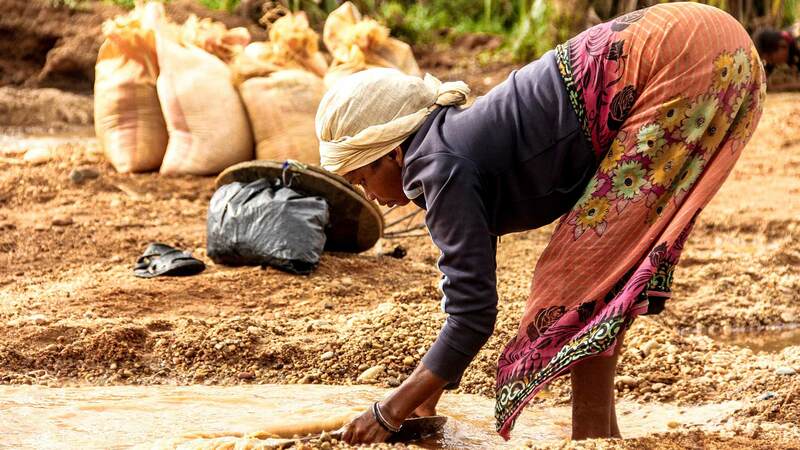 Therefore, it is a worthwhile task for development organisations to foster the creation of durable and profitable supply chains for water control equipment and other inputs, as well as to increase high-value market opportunities for smallholders. In this way they can enable the changes seen in Tippehalli to happen elsewhere. This typically requires interventions on each of the three pillars. However, development agencies can do many things the wrong way : the investment of public money can easily distort markets and thus do more harm than good. A key principle is that development organisations should mainly act as facilitators and accompany those immediately concerned and not deliver services directly. This is a challenging task and requires specific know-how and functions. For each of the three pillars there are specific dos and don ‘ ts. While many development agencies do work in high-value production and profitable marketing, and thus good practices are relatively widely known, there are only a few organisations involved in market creation for affordable technologies aimed at poor people. The understanding of how to do this is limited to rather few actors. Therefore, this booklet presents principles and good practices for development interventions on each of the three pillars, but with a focus on lowcost water control technologies and on creating markets and viable supply chains for them. the work of a range of other organisations and individuals, prominent among them Practica Foundation ( a Dutch NGO ), the International Water Management Institute ( IWMI ), Centro de Estudios y Acción para el Desarrollo ( CESADE ) in Nicaragua, and a joint project by the ECOM group ( a supplier of Nestle ) and IDE on coffee in Nicaragua.